The Gujarat High Court has dismissed the appeal filed by the Employees' State Insurance Corporation (ESIC), Vadodara, challenging the order of the ESI Court, Vadodara to pay disablement benefit as compensation to nine silicosis victims, all of whom are adivasis from Gujarat. Belonging to the Jhalod block in Dahod district, these tribal workers had gone to work in quartz crushing units of Godhara between 2000 and 2005. They were exposed to high level of silica dust at work. Soon they started getting sick and some died. Many left the workplace and went back to their native home. When the People's Training and Research Centre (PTRC), a voluntary organization working on occupational safety and health, came to know about the problem, it approached the state health department and requested an inquiry. The state health commissioner directed the National Institute of Occupational Health (NIOH) Ahmedabad, to make an inquiry. In October 2004, NIOH organized a medical camp in Jhalod Community Health Centre (CHC) and confirmed diagnosis in nine workers out of 24 examined. Later, the tuberculosis (TB) department of the Dahod Civil Hospital kept sent X-rays to NIOH for opinion. The diagnosis was done either by the General Hospital, Vadodara, or the Civil Hospital, Ahemedabad. Following this, PTRC started collecting employment evidence by filing the Right to Information (RTI) pleas. In 15 cases it succeded in collecting adequate evidence. In 2007, 15 victims filed applications before the ESIC local office in Kalol to pay them benefits. But there was no reply. In 2008 the workmen filed an appeal in the ESI Court, Vadodara. Pending hearing, six appellants succumbed to silicosis. Silicosis is known to be a fatal lung disease. In 2015 February, the ESI Court passed an order in favor of the remaining nine applicants. ESIC challenged ESI Court the order in the Gujarat High Court in December 2015. Justice Pardiwala passed the historical judgment, dismissing the ESIC plea. Arguing in the High Court, senior counsel Shilpa Shah for one of the workmen pointed towards how he was examined by the Civil Hospital, Dahod, and x-rays were taken. 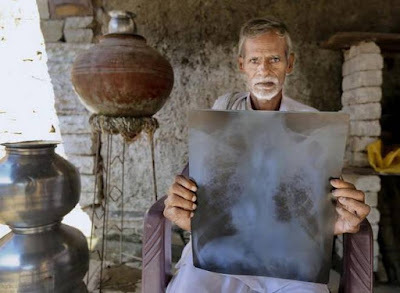 It was diagnosed by the Civil Hospital, Dahod, that he is suffering from silicosis. The medical reports of the workman was forwarded to the NIOH as the respondent was suffering from silicosis. Based on the medical reports, the workman sought compensation from the ESIC. She said, the application filed by the workman, who is registered with the ESI Hospital, was ignored and not acted upon. The victim was not referred to the Medical Board, as per Sector 54-A of the ESI Act by ESIC, even though there was thumping and convincing evidence as regards the respondent suffering from silicosis. This forced the workman file an application directly before the ESI Court in 2008, as his physical condition was deteriorating. In all, Shah said, there the ESI Court heard an appeal from 15 insured persons, out of which six succumbed to the disease during the pendency of the case, adding, the ESI Court observed that the respondents were suffering from disease. The appeal in the ESI Court was filed under Section 75(2A) of the ESI Act stipulates that, in case an insured person is not referred to or examined by a Medical Board by the ESIC, the ESI Court could decide upon the matter to direct ESIC to have such claim determined by the Medical Board. According to Shah, as it was an admitted fact that the workmen were suffering from silicosis, and the list of insured persons suffering from silicosis was produced on record by the Deputy Director of the Appellant Corporation itself. In such circumstances, the ESI Court had cogent and convincing evidence to determine that the respondents were indeed suffering from silicosis. In such circumstances, the consequential benefits to receive the disablement benefit for lifetime are required to be granted, she insisted.